Built: 1895. Original use: J.H.Weber, a merchant, constructed the building with retail space for him on the first floor and the second floor specifically for the Odd Fellows. Items of Note: The lodge hall was also used by the fraternal organization called the Macabees which began meeting there in 1902. The original lot was purchased for 11 dollars in 1809 after the town’s founding. The lot was split in 1886 and today the Odd Fellows building occupies the east half and the adjacent building the west half of the original lot. The building was sold to the Independent Order of Odd Fellows Lodge No. 894 in 1904 for $2,300. Thereafter, a major addition took place. The lodge continued to own the building until 1987, when it was sold to the Tussey Rebekah Lodge No. 66, the female side of the fraternity. After the sale to the Odd Fellows and subsequently to the Tussey Rebekah Lodge, the first floor has been the home to a variety of retailers from meat market to gift shop. 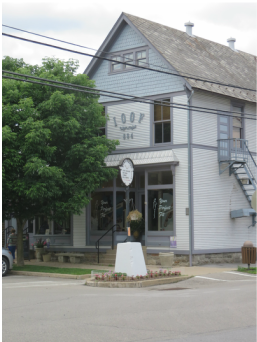 The western part of the building , the portion resembling an “old western”, was built around 1907 to house the Post Office for Boalsburg. It’s not clear why this style of architecture was selected. In 1969, the Country Sampler moved in and later purchased the shop. Recently, the building changed ownership again and underwent major restorations. The first floor is now home to “A Perfect Fit”. During the period of Lodge ownership, the building was a focal point of community social events. In January 1912, the local newspaper reported that the members of the I.O.O.F gave a grand banquet to 200 invited guests highlighted with music from an orchestra and speeches. In addition to the large banquet hall, the second floor also had a billiard room. The maxim of the Odd Fellows was stated as “ We visit the sick, relieve the distressed, bury the dead, and educate the orphan”. This building, since its inception, has been the epitome of architectural multi-tasking serving as post office, retail outlets, lodge hall, community service, and social center.